In 2008, the news was flooded with stories about school shootings and open-fire killings at movie theatres and cities across America. If something were to happen in my own school, what could we do? What would I tell my parents? How would teachers be prepared? I realized that there was no definition for bullying besides the casual “playing around” that all kids do in school. I went to my house school’s faculty, and found that there was no policy or no guidance to educate our school with information about bullying as a silent cause for many people’s deaths. Growing up in a Spanish-speaking household, bullying was not something we talked about or a term my parents even understood. Confused and disappointed, we pitched our idea to the public school board to see if they had any feedback. To our surprise, Broward County had no anti-bullying intitives so the Superintendent decided to fund our project and launch this as a county-wide educational program. What started as home-made posters, powerpoints, and hand-written logos became a branded campaign of videos and teacher/student training material that would be produced and distributed to all 370 Broward County Schools through the Broward Prevention Organization of our school county. Abolish Bullying would teach elementary, middle, and high school students the implications of cyberbullying and talk about the resources schools provided for support. Our trainings guided teachers and parents about ways to talk about bullying openly, how to address the conversation, and how to identify a problem before it happens. 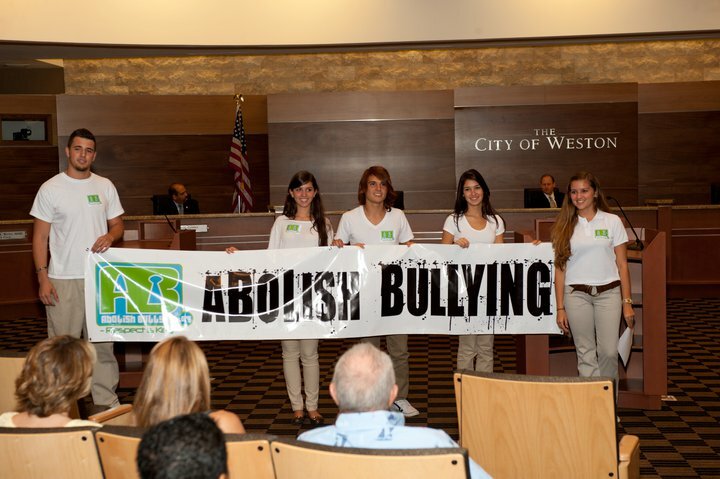 The City of Weston’s Mayor Eric Hersh designated an official "Anti-Bullying" Awareness Week designated to Bullying Education and Prevention. A local newspaper, "El Venezolano" awarded me with a Woman of the Year Award for creating this project for all public schools. The Abolish Bullying project expanded to Miami-Dade County and continues to promote that in order to fully abolish bullying, respect is key.